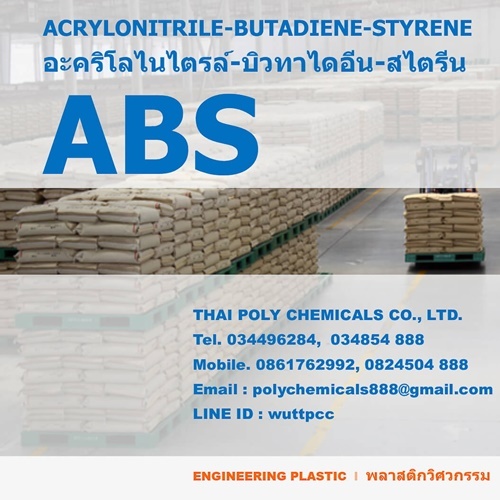 Acrylonitrile Butadiene Styrene (ABS) is a terpolymer, or a polymer composed of three different monomers. This amorphous blend is made up of acrylonitrile, butadiene, and styrene in varying proportions. Each one of these monomers serve to impart an advantage to ABS: acrylonitrile provides chemical and thermal stability, butadiene increase toughness and impact strength, and styrene gives the plastic a nice and glossy finish. Variations in the relative proportions of each monomer can result in drastic changes in the physical properties of ABS. The proportions of individual monomers may vary from 15 percent to 35 percent acrylonitrile, 40 percent to 60 percent styrene, and 5 percent to 30 percent butadiene, resulting in a variety of plastic products suitable for different applications. In addition, blends with other materials such as polyvinylchloride (PVC) and other polycarbonates and polysulfonates have been developed. The discovery of ABS started with the desire to improve on the synthetic rubber styrene-butadiene (SBR). ABS plastics became widely available in the 1950s. The variability of its copolymers and ease of processing made ABS one of the most popular engineering polymers. ABS is one of the most widely used and versatile thermoplastics due to its superior hardness, toughness, gloss, and electrical and chemical resistance. As a ‘bridge’ polymer whose properties lie ***ween commodity plastics and high performance engineering thermoplastics, ABS has become the largest selling engineering thermoplastic. ABS, also known as Acrylonitrile Butadiene Styrene, is a polymer that is composed of three different monomers. These components are acrylonitrile, butadiene, and styrene. The overall property of ABS plastic depends on the constituent proportion of the monomers. Each monomer is responsible for certain properties. อัพเดทล่าสุด : 29 พ.ย. 2561 15:48:10 น.